Isn’t it time to heat up your dining room’s style with sizzling cedar furniture from Woodland Creek’s? What’s cookin’, hot stuff? From what we gather, you’re looking to add some country furniture flair to your dining room. Well, look no further! Woodland Creek’s offers an assortment of 100% cedar cabin log furniture that will have all of your guests clamoring for second helpings. Each piece of cedar log furniture we handcraft and sell is designed to turn up the heat of your existing rustic decor. 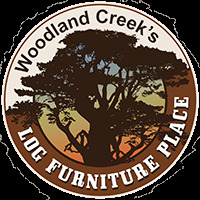 Shop Woodland Creek’s for cedar dining chairs and benches, cedar log pub tables or bars – and more! 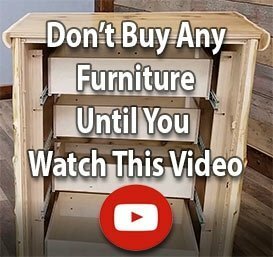 Whether you’re outfitting your home, cabin, cottage or lodge, Woodland Creek’s Log Furniture Place has the cedar wood furniture you want and need. We’re proud to offer cedar log dining tables in all shapes and sizes – for everything from lodge and family style dining to kitchenette sets. Need a stunning, one-of-a-kind corner bench or set of high back dining room chairs? Look no further! Punch up your rustic decorating look with cottage furniture and cabin decor accessories from Woodland Creek’s. Give your banquet or oversized dining room an instant boost with cedar log dining tables. Buy a cedar buffet and hutch or set of cedar log stools for your country decor kitchen. However you display your fine taste in cedar furniture, Woodland Creek’s Log Furniture Place is ready to lead the way.